2019 UH Road Warriors Huskies Football Weekender- 4 Night LAND ONLY Package-HURRY! 1 ROOM LEFT! September 12-16, 2019. Starting from: $995 per person, quadruple occupancy. arrow_backPrevious Nextarrow_forward 2019 UH Road Warriors Huskies Football Weekender- 4 Night LAND ONLY Package-HURRY! 1 ROOM LEFT! Its football Saturday at Husky Stadium nestled high above Union Bay on Lake Washington. Its trademark cantilever metal roof structure traps in sound, making the venue known for being one of the loudest stadiums in the nation. The views from Husky Stadium are unmatched – overlooking Lake Washington, sweeping skylines of Downtown Seattle, Mt. Rainier and the Cascade Mountains to the east and the Olympic Mountain Range to the west. Our hale for this football weekender is at the Grand Hyatt Seattle, the perfect spot for exploring downtown Seattle. Located on Fifth Avenue, you are just a short walk from Pikes Market and steps from great shopping and restaurants. It’s a fun filled weekend you won’t want to miss. If you love sports, we have it all beginning with a Mariners baseball game on Friday night as they take on the Chicago White Sox in our private venue, the Hit it Here Terrace, along right field with outdoor terrace seating, food and beverages. Plus, its fireworks night here at Safeco Field! Football Saturday begins with a pre-game UH Tailgate Party on the stadium grounds and then sit back among the 70,000 plus fans as we rally on our beloved Rainbow Warriors to victory. Sunday, a complete free day to get out and explore on your own or maybe, just maybe the Seahawks are in town and you can make it a “hat trick” weekend. Four nights at the 4-star Grand Hyatt Seattle Hotel. Final payment due by June 1st , 2019. Package is non-refundable after this date. We highly recommend the purchase of trip cancellation insurance. Starting from $995 per person quad occupancy (4 persons sharing existing bedding). Starting from $1,095 per person triple occupancy (3 persons sharing existing bedding). Starting from $1,795 single occupancy. 2019 UH Road Warriors-Huskies Football Weekender 1 ROOMS LEFT! 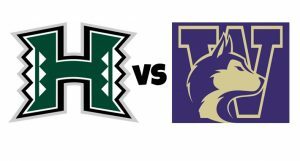 2019 UH Road Warriors-Huskies Football Weekender and Las Vegas-SOLD OUT! 2019 UH Road Warriors-Pacific Northwest Adventure Tour-SOLD OUT! 2019 UH Road Warrior-Pacific Northwest Adventure Tour #2-SOLD OUT! September 9-16, 2019. Starting from: $2,195 per person quadruple occupancy. October 9-13, 2019. Starting from $1,295 per person quad occupancy (4 persons sharing existing bedding).